In love with Formula 1: Chinese GP: A much expected 1-2 for Mercedes! Chinese GP: A much expected 1-2 for Mercedes! Those Sundays are the best when you wake up to watch a Formula 1 race. Luckily today was such a Sunday as the Chinese GP was about to get underway. And what a race this turned out to be! Not necessarily in terms of the battle in the front but some other events further down in the pack. When the lights went out the Mercedes duo kept their double lead with Hamilton first and Rosberg second. Sebastian also maintained his third place. This time Kimi managed to take a stunning start and his driving through the first corners was impressive. The Iceman managed to get past both Williams drivers and he was right at his team-mate´s tail. Massa in his Williams was 5th and his team-mate Bottas 6th but almost immediately it was obvious that Williams had no chance to match Ferrari´s race pace. Exactly how I expected it to be. Red Bull´s race was a catastrophy right from the beginning. Kvyat, who had started to the race on the prime tyres was back in P14 with Ricciardo right behind him. Ricciardo on the soft tyres was significantly faster than his Russian team-mate but it was clear that Kvyat wasn´t going to make overtaking easy for Ricciardo. Soon Kvyat was told on the team radio that he was on a different strategy from his team-mate so he shouldn´t hold Ricciardo up. Still it took a while before Kvyat let his team-mate pass him. Red Bull was definitely in trouble with their tenuous straight line speed. Sebastian was the first top driver to pit for a fresh set of soft tyres on lap 14. A lap later Hamilton pitted from the lead. Mercedes changed their strategies: plan A was to drive the second stint on the prime tyres but because Ferrari had opted for the soft tyres, Mercedes matched their strategy. Rosberg and Kimi also pitted for a set of new soft tyres and the situation in the lead remained unchanged after the first pit stops. At the same time Kvyat in his Red Bull faced a DNF due to an engine failure. Another depressing turn in terms of Red Bull´s race! Around mid-way through the race we heard Rosberg complaining on the team radio about his team-mate´s pace. Nico complained that Lewis drove unnecessarily slowly in the lead which caused Sebastian to catch Nico up. On the other hand Nico didn´t want to close the gap on his team-mate because in that case he would have been forced to drive in the dirty air, which would have destroyed his tyres. In the second half of the race there were solid few-second gaps between the top four and it seemed that neither Rosberg could challenge his team-mate for the win nor could Kimi challenge his Ferrari team-mate for the podium place. The Williams duo were already half a minute behind the lead. Mercedes and Ferrari had identical strategies: both teams chose the prime tyres for the last stint. Williams on the other hand opted for the prime tyres on both their second and last stint, which made Massa and Bottas even slower and unable to match Ferrari´s pace. Towards the end of the race we heard some legendary team radio comments from Kimi once again. When the Iceman was lapping Alonso in his McLaren (what a pulsating moment to see as Kimi and Alonso were team-mates at Ferrari last year) he told on the radio:" Get the McLaren out of the way!" Classic Kimi! A few laps later he repeated the same message on the radio when there were Lotus´ Maldonado and McLaren´s Button ahead of him. Behind the lead Toro Rosso´s Max Verstappen had performed in an impressive way. The young Dutchman was in P8 and about to score valuable points for Toro Rosso again but then something unexpected happened when there were only two more laps to go. Verstappen´s STR10 was hit with an engine failure and it stopped on the finish straight. That was such a shame, I was so gutted for Verstappen! He had shown some impressive overtaking moves previously in the race. Due to the lack of straight line speed he couldn´t use DRS to pass his rivals but instead he braked very late into corners and gained the advantage there. It would have been a certain points finish for the Dutchman! He´s performance in spite of his young age has impressed me greatly. In spite of the fact that he still has many things to learn in terms of the procedures like what buttons to press when your engine fails he has definitely proved that he is in the right place in the right time. There´s no doubt this man knows how to drive an F1 car! And he has done it in a mature style. Without the technical failures he´d have scored points in all three races this year. At Shanghai he would also have beaten Ricciardo in his Red Bull (Kvyat and Sainz had already retired from the race), which definitely caught my eye. Due to Verstappen´s engine failure safety car was deployed. At the same time we saw a comical episode when the track marshals tried to push Verstappen´s car off the track. This turned out to be a difficult task: the car hit the wall many times before the marshals got their job done! Unfortunately there were only two more laps to go, which meant that driving to the chequered flag behind the safety car was an empty climax for the race. Hamilton won the Chinese GP with Rosberg second and Vettel 3rd. Kimi finished 4th, Massa 5th, Bottas 6th, Grosjean 7th (well done from the French Lotus driver! ), Nasr 8th, Ricciardo 9th and Ericsson 10th. Without the safety car it would have been thrilling to see if Kimi could have challenged his team-mate for the podium place. Kimi set excellent lap times in the second half of the race and was the fastest of the top four drivers. He had already closed the gap to Sebastian into 1,5 seconds. Though closing the gap is one thing and making the overtaking move is a whole different thing! Well, we´ll never find out! Hamilton is still leading the drivers´ standings with 68 points to Vettel´s 55. Rosberg is third with 51 points. Kimi has now 24 points. Mercedes has a strong lead in the constructors´ standings with 119 points to Ferrari´s 79. But it´s definitely interesting to see how things evolve at Mercedes. There seems to have started a war between the Mercedes team-mates in the post-race press conference. Rosberg has openly complained about Hamilton ruining his race by driving unnecessarily slowly in the lead. Hamilton responded to his team-mate by saying that it wasn´t his job to take care of Nico´s race and if he was too slow Nico could have tried to pass him. 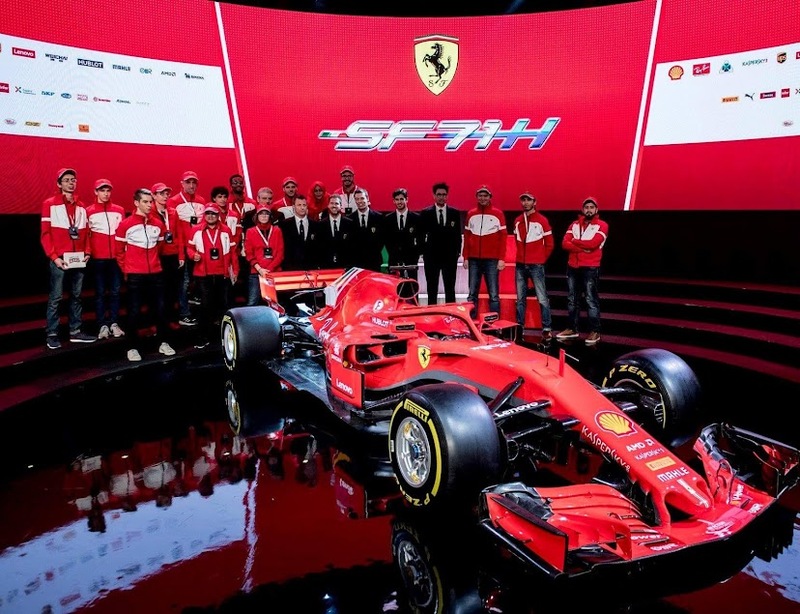 I don´t mind if there´s a psychological war breaking loose because this only benefits Ferrari, who have a perfect harmony in the team. Luckily there´s only one week to wait until the next race in Bahrain! I love these back-to-back races!